Viral hemorrhagic septicemia (VHS) is a deadly infectious fish disease caused by viral hemorrhagic septicemia virus (VHSV). It afflicts fish of over 50 species of freshwater and marine fish in several parts of the northern hemisphere. VHS is caused by viral hemorrhagic septicemia virus (VHSV), different strains of which occur in different regions, and affect different species. There are no signs that the disease affects human health. VHS is also known as "Egtved disease," and VHSV as "Egtved virus." Historically, VHS was associated mostly with freshwater salmonids in western Europe, documented as a pathogenic disease among cultured salmonids since the 1950s. Today it is still a major concern for many fish farms in Europe and is therefore being watched closely by the European Community Reference Laboratory for Fish Diseases. It was first discovered in the US in 1988 among salmon returning from the Pacific in Washington State. This North American genotype was identified as a distinct, more marine-stable strain than the European genotype. VHS has since been found afflicting marine fish in the northeastern Pacific Ocean, the North Sea, and the Baltic Sea. Since 2005, massive die-offs have occurred among a wide variety of freshwater species in the Great Lakes region of North America. VHSV is a negative-sense single-stranded RNA virus of the order Mononegavirales, family Rhabdoviridae, and genus Novirhabdovirus. (ICTV virus classification, unlike biological classification, begins with the order.) Its NCBI-assigned Taxonomy ID is 11287. Another related fish rhabdovirus in the genus Novirhabdovirus is the Infectious hematopoietic necrosis virus (IHNV), which causes infectious hematopoietic necrosis (IHN) disease in solmonidae. The viral cause of the disease was discovered in 1963 by M. H. Jenson. The virus is an enveloped, bullet-shaped particle, about 180 nm long by 60 nm in diameter, covered with 5 to 15 nm long peplomers. The genome of VHSV is composed of approximately 11-kb of single stranded RNA, which contains six genes that are located along the genome in the 3′-5′ order: 3′-N-P-M-G-NV-L-5′, nucleocapsid protein (N), polymerase-associated phosphoprotein (P), matrix protein (M), surface glycoprotein (G), a unique non-virion protein (NV), and virus polymerase (L). Reverse genetics is a powerful tool to study and characterize the previously unknown viral genes. Reverse genetics system is currently available for VHSV. A vaccinia virus free reverse genetic system for Great Lakes VHSV (Genotype IVb) was developed by a research group from the USA. This system allows the investigators to explore the functional properties of individual viral genes of VHSV in detail. This system was immediately utilized to characterize the non-virion (NV) gene of novirhabdoviruses. Even though it has been demonstrated that the NV gene is not necessary for viral replication, it is highly essential for viral pathogenesis. A new role of NV protein has been discovered and demonstrated that it inhibits apoptosis at the early stage of viral infection. This discovery unlocked the mystery of presence of NV proteins in novirhabdoviruses. III Marine fish of the British Isles and northern France, farmed turbot in the UK and Ireland, and Greenland halibut (Reinhardtius hippoglossoides) in Greenland. Farmed rainbow trout in Norway. Type I-a was the only strain known from VHSV's discovery in 1963 until the late 1988, isolated to fish farms in continental Europe, affecting primarily rainbow trout and occasionally brown trout or pike. In 1988, the first marine strain of VHSV, now designated type IV, was found in normal-appearing salmon returning from the Pacific to rivers of Washington State. This strain and other marine strains were not lethal to rainbow trout. The discovery prompted further studies, and by the mid-1990s, marine VHSV was found in eight species along the northern North America's Pacific coast, and 14 species in and around the Atlantic's North Sea. 1996 saw the first VHSV in Japan, among Japanese flounder farmed in the Seto Inland Sea, and different genotypes have appeared in different areas since then. Type IV was later found off North America's northern Atlantic coast, in Atlantic herring (Clupea harengus) mummichog (Fundulus heteroclitus), stickleback (Gasterosteus aculeatus aculeatus), brown trout (Salmo trutta), and striped bass (Morone saxatilis), as well as dozens of freshwater species in the Great Lakes. VHSV continues to be found in new geographical areas, in new species of fish. This is thought to represent both the spread of the virus into new areas, as with VHSV egg and live fish transfers from North America to Asia, or feeding of raw marine fish to inland farmed trout in Finland, as well as discovery of existing populations, as with an apparently well established marine reservoir in the Black Sea. To keep track of the distribution of different VHSV genotypes, a database called Fishpathogens.eu has been created to store data on different fish pathogens (including VHSV) and their sequences. This virus appears to have evolved in the Pacific Northwest of North America. It appears to have diverged into several strains ~300 years ago. The Type IV-b strain of VHSV has been spreading among freshwater fish in the Great Lakes region since at least 2003, resulting in some massive die-offs since 2005 of many species in the affected lakes. Originally found off the Atlantic coast of Canada, it was considered a low mortality marine strain. Its first detection in freshwater was in Lake Ontario in 2005, and then in an archived 2003 sample from Lake St. Clair. The isolate was named MI03GL and was sequenced for its entire genome. The North American genotype of the virus, in addition to moderate mortality to salmonid species, including various varieties of trout, is also proving virulent among a wide variety of warm-water species previously considered resistant to VHS. The Great Lakes region variant has killed lake trout, steelhead trout, chinook salmon, yellow perch, gobies, emerald shiners, muskies, whitefish, and walleye. While the European strain of VHSV is particularly deadly to rainbow trout, the Great Lakes region variant affects the species only mildly, as is typical with primarily marine genotypes. An archived 2003 sample from Lake St. Clair of Great Lakes muskellunge is the earliest confirmed case of VHSV within the Great Lakes region. Lake St. Clair connects to Lake Erie through the Detroit River to the south, and to Lake Huron through the St. Clair River to the north. The sample was not tested for VHS until 2005, after the disease was detected in Lake Ontario. 2005 samples of Lake Ontario freshwater drum and Lake Huron lake whitefish were infected with VHS. Initially classified as an unknown rhabdovirus, the Lake Ontario sample was confirmed to be VHSV in 2006, while the Lake Huron sample was confirmed to be VHSV in 2007. 2006 saw mass die-offs from VHS in Lake Erie, the St. Clair River, the Detroit River, and the St. Lawrence River, which connects the Great Lakes to the Atlantic Ocean. VHS was further detected in the Niagara River, which connects Lake Erie to Lake Ontario. It was also found in a walleye die-off in the landlocked inland Conesus Lake, the westernmost of the Finger Lakes in western New York state. This was the first case in the region outside waters contiguously connected to the Great Lakes. On May 12, 2007, the Wisconsin DNR announced the likely presence of VHS in Wisconsin's inland Little Lake Butte des Morts. Preliminary tests of samples of freshwater drum collected on May 2 were positive, and the announcement came amidst a die-off of hundreds of freshwater drum there and on neighboring Lake Winnebago. Preliminary tests later indicated VHS in specimens from Lake Winnebago. The lakes drain through the Fox River to Lake Michigan's Green Bay. On May 17, 2007, the Michigan DNR confirmed the presence of VHS in the Michigan's inland Budd Lake, a popular fishing destination is in the central part of Michigan's lower peninsula. A major die-off of VHS-positive muskies, bluegills, and black crappie began on April 30, 2007. On May 24, 2007, preliminary tests indicated the presence of VHS in a brown trout from Lake Michigan, the second largest freshwater lake in the United States. Contamination in the lake had been expected for months by experts, since the presence of VHS was confirmed in the connected Lake Huron. On July 14, 2007, federal labs confirmed the presence of VHS in Skaneateles Lake, the second of New York's Finger Lakes to test positive for the disease. The disease caused a large die-off of bass in the spring of 2007. Before the Type IVb die-offs in the Great Lakes, few states regulated transfer of live species other than for salmonids. Since 2005, new policies have been adopted concerning fish and egg transfer, use of live bait, and water transfer, aimed at curtailing the spread to new lakes and rivers in the region. As of July 13, 2007, new rules have been enacted in the Canadian province of Ontario, and US states of Michigan, New York, Ohio, Pennsylvania, and Wisconsin, while they are currently being drafted in Illinois, Indiana, and Minnesota. Additionally, the USDA's Animal and Plant Health Inspection Service issued a federal order in the fall of 2006 barring the transfer of all live susceptible species from the eight states bordering the lower Great Lakes, as well as importing such species from The Canadian provinces of Ontario and Quebec. VHSV can be spread from fish to fish through water transfer, as well as through contaminated eggs, and bait fish from infected waters. The emerald shiner is a particularly popular bait fish in the Great Lakes region, and is among the species afflicted. Survivors of the disease can become lifelong carriers of the virus, contaminating water with urine, sperm, and ovarian fluids. The virus has been shown to survive two freeze/thaw cycles in a conventional freezer, suggesting both live and frozen bait could be a transmission vector. In Europe, the gray heron has spread the virus, but it does so mechanically; the virus is apparently inactive in the digestive tract of birds. Fish that become infected experience hemorrhaging of their internal organs, skin, and muscle. Some fish show no external symptoms, but others show signs of infection that include bulging eyes, bloated abdomens, bruised-looking reddish tints to the eyes, skin, gills and fins. 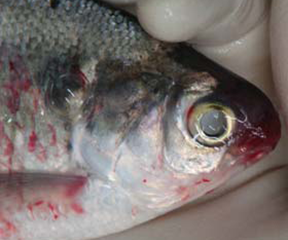 Some infected fish have open sores that may look like the lesions from other diseases or from lamprey attacks. There may also be a nervous form of the disease where fish are constantly flashing and showing abnormal behaviour. Living fish afflicted with VHS may appear listless or limp, hang just beneath the surface, or swim very abnormally, such as constant flashing circling due to the tropism of the virus for the brain. External signs may include darker coloration, exophthalmia ("pop eye"), pale or red-dotted gills, sunken eyes, and bleeding around orbits (eye sockets) and at base of fins. Genetics researchers at the Lake Erie Research Center at the University of Toledo are developing a test that will speed diagnosis from a month to a matter of hours. VHSV is a hemorrhagic disease, meaning it causes bleeding. Internally, the virus can cause petechial hemorrhaging (tiny spots of blood) in internal muscle tissue, and petechial or severe hemorrhaging in internal organs and other tissues. Internal hemorrhaging can be observed as red spots inside a dead fish, particularly around the kidney, spleen, and intestines, as well as the swim bladder, which would normally have a clear membrane. The liver may be pale, mottled with red hyperemic areas, the kidney may be swollen and unusually red, the spleen may be swollen, and the digestive tract may be empty. External signs are not always present, but if they are, hemorrhaging on the skin's surface can appear as anywhere from tiny red dots (petechiae) to large red patches. Preliminary diagnosis involves histopathological examination, observing tissues through a microscope. Most tissue changes can be observed as minor to major necrosis (cell death) in the liver, kidneys, spleen, and skeletal muscle. The hematopoietic (blood-forming) areas of the kidney and spleen are the initial area of infection, and should show necrosis. The gill may have thickened lamellae, and the liver may have pyknotic nuclei. Skeletal muscle accumulates blood but does not suffer much damage. Electron microscopy can reveal the bullet-shaped rhabdovirus, but is not adequate for definitive diagnosis. The Manual or Diagnostic for Aquatic Animals, 2006, is the standard reference for definitive tests. In most cases, cell culturization is recommended for surveillance, with antibody tests and reverse transcription polymerase chain reaction (RT-PCR) and genetic sequencing and comparison for definitive confirmation and genotype classification. Virus neutralisation is another important method of diagnosis, especially for carrier fish. Thoroughly cleaning boats, trailers, nets and other equipment when traveling between different lakes and streams also helps. The only EPA-approved disinfectant proven effective against VHS is Virkon AQUATIC (made by Dupont). Chlorine bleach kills the VHS virus, but in concentrations that are much too caustic for ordinary use. Disinfecting stations can be found at various inland lake boat launches in the Great Lakes region. ^ a b c d e Disease Factsheets: Viral Hemorrhagic Septicemia Iowa State University, The Center for Food Security & Public Health. Last updated May 17, 2007. Retrieved on 2007-07-12. ^ a b c McAllister, Philip E. Fish Disease Leaflet 83: Viral Hemorrhagic Septicemia of Fishes. United States Department of the Interior, U.S. Fish and Wildlife Service. 1990. Retrieved on 2007-07-12. ^ a b c Description of Viruses: Family Rhabdoviridae, Genus Novirhabdovirus. Virus Taxonomy Online: Seventh Report of the International Committee on Taxonomy of Viruses. 2000. Retrieved on 2007-07-12. ^ Meyers, TR; Sullivan, J; Emmenegger, E; Follett, J; Short, S; Batts, WN; Winton, JR (1992). "Identification of viral hemorrhagic septicemia virus isolated from Pacific cod Gadus macrocephalus in Prince William Sound, Alaska, USA". Diseases of Aquatic Organisms. 12: 167–75. doi:10.3354/dao012167. ^ NCBI Taxonomy browser (Viral hemorrhagic septicemia virus). NCBI Taxonomy Database. United States Department of Health and Human Services, National Institutes of Health, National Library of Medicine, National Center for Biotechnology Information. Retrieved on 2007-07-14. ^ The Virus Species Concept: Introduction Virus Taxonomy Online: Seventh Report of the International Committee on Taxonomy of Viruses. 2000. Retrieved on 2007-07-12. ^ Kipp, Rebekah M. and Anthony Ricciardi. VHS Factsheet. 2006-12-08. Retrieved on 2007-07-16. ^ Biacchesi, S; Lamoureux, A; Mérour, E; Bernard, J; Brémont, M (2010). "Limited interference at the early stage of infection between two recombinant novirhabdoviruses: Viral hemorrhagic septicemia virus and infectious hematopoietic necrosis virus". Journal of Virology. 84 (19): 10038–50. doi:10.1128/JVI.00343-10. PMC 2937753. PMID 20631140. ^ a b Ammayappan, A; Kurath, G; Thompson, TM; Vakharia, VN (2011). "A reverse genetics system for the Great Lakes strain of viral hemorrhagic septicemia virus: The NV gene is required for pathogenicity". Marine biotechnology. 13 (4): 672–83. doi:10.1007/s10126-010-9329-4. PMID 20936318. ^ Ammayappan, A; Vakharia, VN (2011). "Nonvirion protein of novirhabdovirus suppresses apoptosis at the early stage of virus infection". Journal of Virology. 85 (16): 8393–402. doi:10.1128/JVI.00597-11. PMC 3147959. PMID 21653667. ^ a b Nishizawa, T; Iida, H; Takano, R; Isshiki, T; Nakajima, K; Muroga, K (2002). "Genetic relatedness among Japanese, American and European isolates of viral hemorrhagic septicemia virus (VHSV) based on partial G and P genes". Diseases of Aquatic Organisms. 48 (2): 143–8. doi:10.3354/dao048143. PMID 12005236. ^ Thiéry, R; De Boisséson, C; Jeffroy, J; Castric, J; De Kinkelin, P; Benmansour, A (2002). "Phylogenetic analysis of viral haemorrhagic septicaemia virus (VHSV) isolates from France (1971-1999)". Diseases of Aquatic Organisms. 52 (1): 29–37. doi:10.3354/dao052029. PMID 12517003. ^ a b Einer-Jensen, K. (2004). "Evolution of the fish rhabdovirus viral haemorrhagic septicaemia virus". Journal of General Virology. 85 (5): 1167–79. doi:10.1099/vir.0.79820-0. ^ a b Nishizawa, T.; Savas, H.; Isidan, H.; Ustundag, C.; Iwamoto, H.; Yoshimizu, M. (2006). "Genotyping and Pathogenicity of Viral Hemorrhagic Septicemia Virus from Free-Living Turbot (Psetta maxima) in a Turkish Coastal Area of the Black Sea" (PDF). Applied and Environmental Microbiology. 72 (4): 2373–8. doi:10.1128/AEM.72.4.2373-2378.2006. PMC 1449023. PMID 16597932. ^ a b Gagné, N; MacKinnon, A-M; Boston, L; Souter, B; Cook-Versloot, M; Griffiths, S; Olivier, G (2007). "Isolation of viral haemorrhagic septicaemia virus from mummichog, stickleback, striped bass and brown trout in eastern Canada". Journal of Fish Diseases. 30 (4): 213–23. doi:10.1111/j.1365-2761.2007.00802.x. PMID 17394523. ^ Dale, OB; Ørpetveit, I; Lyngstad, TM; Kahns, S; Skall, HF; Olesen, NJ; Dannevig, BH (2007). "Outbreak of viral haemorrhagic septicaemia (VHS) in seawater-farmed rainbow trout in Norway caused by VHS virus Genotype III". Diseases of aquatic organisms. 85 (2): 93–103. doi:10.3354/dao02065. PMID 19694169. ^ ICES. Report of the ICES Advisory Committee on Fishery Management, Advisory Committee on the Marine Environment and Advisory Committee on Ecosystems, 2006. 2006. ICES Advice. Books 1 - 10. 1,68 pp. ^ a b c d e f Whelan, Gary E. Viral Hemorrhagic Septicemia (VHS) Briefing Paper. Michigan Department of Natural Resources. 2007-02-26. Retrieved 2007-07-13. ^ a b c d e Crane, M. Chapter 2.1.5: Viral Hemorrhagic Septicaemia Manual of Diagnostic Tests for Aquatic animals 2006. Retrieved 2007-07-16. ^ Importation of pilchards (Sardinops sagax) for direct introduction into natural waters: Biosecurity policy review of viral haemorrhagic septicaemia virus (VHSV), Draft Report, June 2003. Commonwealth of Australia. 2003. Retrieved 2007-07-16. ^ Isshiki, T; Nishizawa, T; Kobayashi, T; Nagano, T; Miyazaki, T (2001). "An outbreak of VHSV (viral hemorrhagic septicemia virus) infection in farmed Japanese flounder Paralichthys olivaceus in Japan". Diseases of Aquatic Organisms. 47 (2): 87–99. doi:10.3354/dao047087. PMID 11775799. ^ Elsayed, E; Faisal, M; Thomas, M; Whelan, G; Batts, W; Winton, J (2006). "Isolation of viral haemorrhagic septicaemia virus from muskellunge, Esox masquinongy (Mitchill), in Lake St Clair, Michigan, USA reveals a new sublineage of the North American genotype". Journal of Fish Diseases. 29 (10): 611–9. doi:10.1111/j.1365-2761.2006.00755.x. PMID 17026670. ^ He, Mei; Yan, Xue-Chun; Liang, Yang; Sun, Xiao-Wen; Teng, Chun-Bo (2014). "Evolution of the viral hemorrhagic septicemia virus: Divergence, selection and origin". Molecular Phylogenetics and Evolution. 77: 34–40. doi:10.1016/j.ympev.2014.04.002. PMID 24727199. ^ a b CSU Research Proposal - "Economic impacts of private sector aquaculture-based recreational fishing in the western USA" Colorado Aquaculture Association. Retrieved on 2007-07-12. ^ Ammayappan, Arun; Vakharia, Vikram N (2009). "Molecular characterization of the Great Lakes viral hemorrhagic septicemia virus (VHSV) isolate from USA". Virology Journal. 6: 171. doi:10.1186/1743-422X-6-171. PMC 2771013. PMID 19852863. ^ Viral Hemorrhagic Septicemia in New York State Highlights. Cornel University, College of Veterinary Medicine, Department of Microbiology and Immunology, Aquatic Animal Health Program. Retrieved 2007-07-14. ^ Viral Hemorrhagic Septicemia (VHS) in New York. New York State Department of Environmental Conservation. Retrieved 2007-07-14. ^ Fish likely infected with deadly virus found in Little Lake Butte des Morts; Menasha Lock closed; Public asked to take steps to stop the spread. (News release). Wisconsin Department of Natural Resources. 2007-05-12. Retrieved 2007-07-13. ^ Lake Winnebago Fish Preliminarily Test Positive for VHS. (News release). Wisconsin Department of Natural Resources. 2007-05-18. Retrieved 2007-07-13. ^ Barta, Jim. Michigan's Best Bets for Muskies Archived 2009-02-27 at the Wayback Machine. Michigan Sportsman. Retrieved July 15, 2007. ^ Fish Disease Discovered in Budd Lake, Clare County Archived 2008-12-14 at the Wayback Machine. (Press Release). Michigan Department of Natural Resources. May 17, 2007. Retrieved July 15, 2007. ^ Trout from Lake Michigan likely VHS positive. (News release). Wisconsin Department of Natural Resources. 2007-05-24. Retrieved 2007-07-13. ^ Figura, Dave. Federal Lab Confirms VHS Caused Fish Kill Archived 2007-10-12 at the Wayback Machine. The Post-Standard. 2007-07-14. Retrieved on 2007-07-15. ^ Ontario Government Acting Swiftly to Control Further Spread of New Fish Virus. (Press release). Ontario Ministry of Natural Resources. 2007-01-08.Retrieved on 2007-07-15. ^ Sander, Libby. Michigan’s Summer Fishing Turns Less Carefree New York Times. 2007-07-13. Retrieved 2007-07-13. ^ Gustafson, Lori VHS Surveillance Planning Under Way NAHSS Outlook, Quarter One 2007. Retrieved 2007-07-16. ^ Feature Story: Viral Hemorrhagic Septicemia: A New Invader in the Great Lakes Fish Lines, Vol. 5, No. 5, FY 2007. Retrieved 2007-07-16. ^ Kipp, Rebekah M. and Anthony Ricciardi. Viral Hemorrhagic Septicemia (VHS) Factsheet. NOAA National Center for Research on Aquatic Invasive Species, Great Lakes Aquatic Nonindigenous Species Information System (GLANSIS). 2006-12-08. Retrieved 2007-07-13. ^ Boomgaard, Jon. New fish virus could be a little as 2 years away from Lake Michigan. Ludington Daily News. 2007-01-09. Retrieved 2007-07-13. ^ Viral Haemorrhagic Septicaemia expert reviewed and published by WikiVet, accessed 11 October 2011. ^ a b Groocock, Geoffrey H. Viral Hemorrhagic Septicemia and Spring Viremia of Carp: Threats to Aquaculture Cornell University, College of Veterinary Medicine, Department of Microbiology and Immunology, Aquatic Animal Health Program. 2007. Retrieved on 2007-07-18. Species Profile - Viral hemorrhagic septicemia (Novirhabdovirus), National Invasive Species Information Center, United States National Agricultural Library. Lists general information and resources for viral hemorrhagic septicemia.